Is Arrow's Deathstroke About To Return? Warning: major possible spoilers ahead for the rest of Season 4 of Arrow. Proceed at your own risk. Arrow has had no shortage of big bad guys over its four seasons so far, and none have been bigger or badder than Slade Wilson as Deathstroke. Oliver’s friend-turned-nemesis set a high standard for supervillains, and Arrow hasn’t quite been the same without him. Now an Australian promo has been released that shows brief clips from all three CW DC series, and Deathstroke himself can be seen in all his Arrow glory once more. Between the flashbacks and magic on Arrow, the parallel worlds on The Flash and the time travel on Legends of Tomorrow, there are admittedly plenty of ways for Deathstroke to return without really returning. This could be a look at Deathstroke in a flashback or Deathstroke on Earth-2 or some other version of Deathstroke in another timeline. 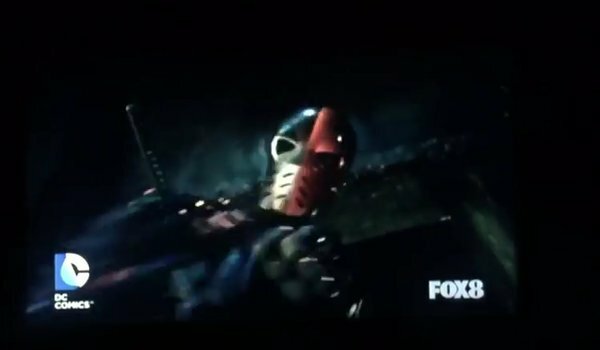 Still, there are some major clues that the look at Deathstroke in the Australian clip actually takes place in the present on Arrow. There are a few reasons why we might not want to get too excited about the real Slade Wilson possibly returning as Deathstroke in Season 4. One is just the fact that it’s hard to believe that Arrow would have been able to keep the return of Manu Bennett to the show a secret. Another is that Bennett didn't seem eager to return after expressing his dislike for how Deathstroke was changed from unstoppable mercenary to lovesick crazy man, and Slade losing his fight to Oliver and Thea in his one-off appearance in Season 3 seemed to add insult to injury. A third is that it’s hard to imagine why Oliver would be on Lian Yu in a tuxedo unless it comes via hallucination or dream sequence. Personally, I’m choosing to be optimistic that we’ll somehow be getting another look at Deathstroke 1.0 in the present on Arrow. Technically, Manu Bennett doesn’t even need to be back for Slade to show up. There’s a Deathstroke mask stuck in the shore of Lian Yu just waiting to be recovered. Throw in the fact that Slade had to actually father the future Deathstroke 2.0 at some point, and we even may be in for a Deathstroke escape from ARGUS captivity. Slade still has some promises to Oliver he needs to keep, and he definitely has a score to settle with the girl in the glasses. Be sure to tune into Arrow Wednesdays at 8 p.m. ET to see what happens next that might bring Deathstroke back, and don’t forget to check out our schedule of summer TV premiere dates.